We favor technology and more cyclical industries, particularly in light of continued economic growth and the Fed putting rate hikes on hold. 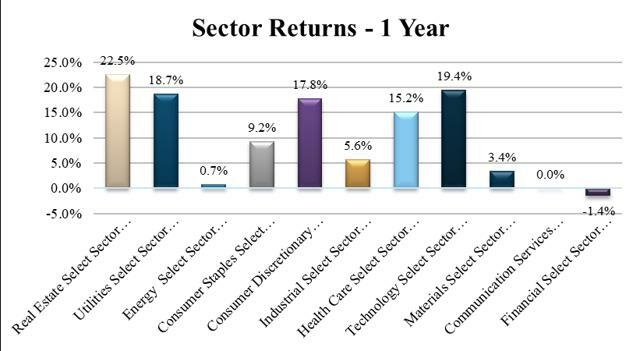 Defensive sectors might still be good income plays but may not provide much upside. While we rate some sectors neutral, their performance could be sensitive to several economic drivers that have been highly volatile. In other words, performance could vary considerably. The same kind of dynamic occurs in investing. Defense preserves your wealth, while offense generates growth. In investment parlance, we often talk about these concepts by referring to risk-on vs. risk-off positions depending on forecasts of the economic environment and our assessment of how clear the investment horizon appears. We can look at investing as a combination of offense and defense in two ways. The first way is when we intentionally invest in cyclical (offense) sectors or defensive sectors based on the level of uncertainty and when opportunities are weighted more in one direction vs. the others. Another way is to set aside whether a sector is cyclical or defensive, but rather, evaluate the opportunities that companies in certain sectors might be able to take advantage of. That means tactically allocating to sectors we favor (offense) while lowering our exposure to sectors where we identify relatively higher risks (defense) and/or lower relative expected returns. Sometimes these two approaches overlap, but not always. In the rest of this article, we will provide readers with a quick overview of each sector and how each portfolio should be positioned relative to each sector. Over the last month, Real Estate and Consumer Discretionary continued their outperformance with a 5.5% return and 4.7% return, respectively. Technology was the overall leader with a 6.7% return in what was a mixed bag of results across sectors. Financials, Energy, and Healthcare all had negative returns, led by Exxon Mobil (XOM), Chevron (CVX), Citigroup (C), and UnitedHealth Group (UNH). For investors using tactical allocation strategies at the sector level within US equities, there continue to be opportunities to generate returns above the broader market. Over the last year, Real Estate has outperformed all other sectors with a 22.5% return and the Fed's intention to "wait-and-see" has benefited high dividend paying sectors Utilities as well. The latter have had 18.7% total returns over the last year. Sandwiched in between the two was Technology, with a return of 19.4%. 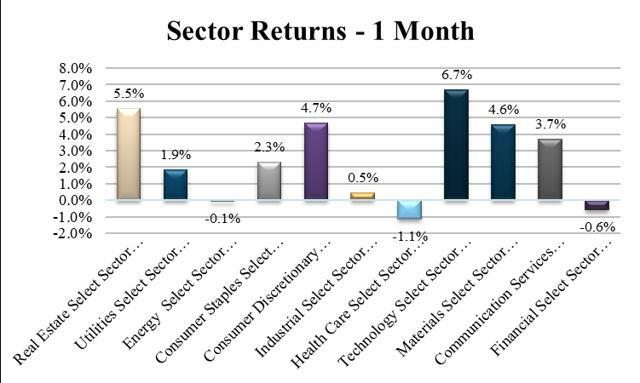 On the opposite end of the spectrum was the Financial sector, with a total return over the last year of just 1.4%. Despite rates being slightly higher than they were last year - a benefit to banks - the yield curve has continued to remain relatively flat, and the 2-5 year spread briefly inverted last month. A flat or inverted yield curve hurts banks because they borrow at short-term rates (deposits) and lend at longer rates. The other two notable sectors were Consumer Discretionary and Healthcare, with returns of 17.8% and 15.2%, respectively. Investors looking for yield in Real Estate, the highest paying dividend sector, also have been rewarded with considerable price appreciation. At a 3.3% dividend yield, the yield on Real Estate is just 20 bps higher than that of Utilities and Energy, but as we mentioned earlier, returned 22% over the previous year. A pleasant surprise that we believe may repeat over the next 12 months. Note that Communication Services does not indicate a dividend yield but does have dividend-paying stocks. After the sector's realignment and inclusion of former Technology stocks, the sector no longer has a comparable history of performance. We will have to wait 12 months to start seeing some of this data being reported. Our overall take on each sector follows along with a few individual stock ideas within each sector for investors looking to invest in what I call "the third level" - S&P 500 Sector Company. 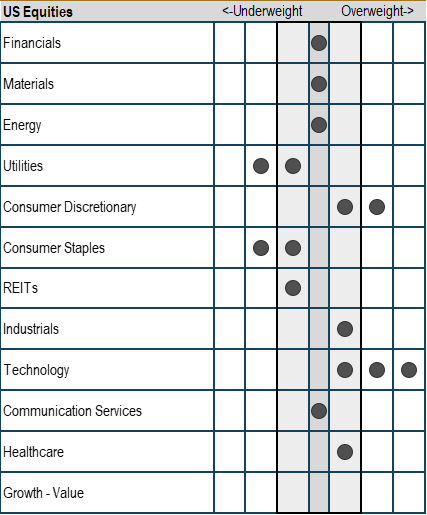 If you prefer to remain well diversified, but still want to take sector positions, we've included the names of the relevant sector ETF within each section too. Commodity prices were pushed down by the strong dollar last year and we don't see that trend reversing, although the last 30 days has witnessed a spike in commodities across the board, likely due to the Fed's pause and the increased possibility of higher inflation and even odds of a rate cut later in the year. Trade tensions with China may subside in the near term which might have an impact on steel prices. The challenge is figuring out just what that impact will be. If the tariffs remain in place we should see prices remain elevated, which benefits the industry and improves the competitiveness of US companies, but the rise in prices may eventually dampen demand. Materials had one of the biggest declines in earnings estimates from 12/31/2018 to today, dropping from 3.8% to -3.7% according to FactSet. The forward PE is roughly in line with both the 5- and 10-year average, but the target price is 11.2% above current levels. If earnings are declining and the multiple is in-line, we don't see how prices are going to increase that much unless it's pure speculation. If oil prices recover, that might be. We rate the sector Neutral but note that the one sub-sector with earnings estimates higher than December are those in Oil and Gas Infrastructure. 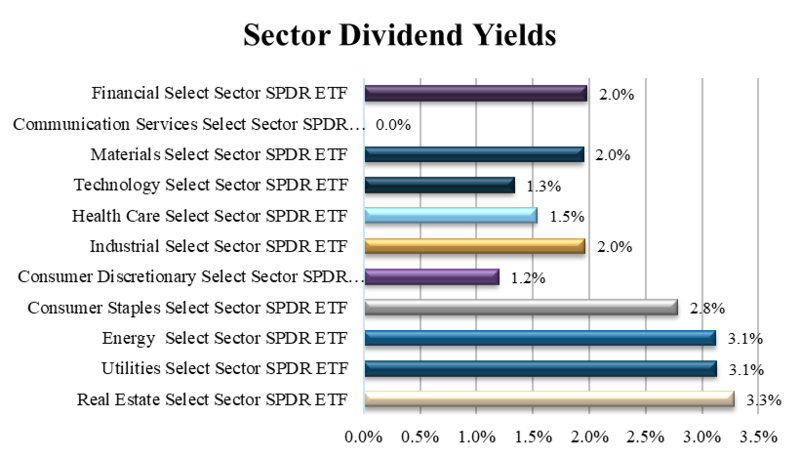 The Materials Select Sector SPDR ETF (XLB) has a dividend yield of just 2% but one of its biggest holdings, DowDuPont (DWDP) has a 4% dividend. Another high yielder within the sector is LyondellBasell Industries (LYB) with a 4.3% dividend. Now that the sector is about six-months-old, we should start seeing some relevant data, although don't be surprised by the Jekyll and Hyde potential of the sector. One the one hand are high growth names like Facebook (FB) and Google (NASDAQ:GOOG) (NASDAQ:GOOGL), while on the other, you have slower growth names like AT&T (T). No need to implement a barbell strategy with this sector. It's built in. Consumer spending should continue to drive media consumption demand which is good news for content providers, digital platforms, and filmed entertainment companies. On the other hand, we don't see a change to the margin compression we have seen among telecom providers even if the rollout of 5G creates opportunities. Analysts estimate EPS growth of 5.7% for CY 2019, down from 8.2% just three months ago, and the sector overall looks expensive. It currently trades at a forward PE multiple of 17.3 compared to its five-year average of 13.2, according to FactSet. We are assuming the average PE is based on a backtest using the newly created sector, otherwise, the valuation would be skewed. That said, the consensus bottom up target price for the sector is 14% above current levels, the second highest among all sectors. The positive price target forecast is likely due to Facebook, Alphabet, and Disney (DIS), the three largest positions within the Communications Services Select Sector SPDR ETF (XLC). Restaurant spending should continue to trend upward as consumers trade from higher priced options or dining at home. The gap between the cost of a meal for four people dining out and dining at home has narrowed over the years - making it more convenient to dine out. With the job market still strong and wages rising, we see further strength in this segment, which we mentioned last month. Hotels also should start to benefit from economic growth, low gas prices, and demand from both individual and business travelers. Retail spending also should hold up well so long as the job market remains strong, even if it doesn't improve much from here. Frankly, it can't improve much from these levels without causing a spike in inflation - in which case we are having a completely different conversation. For now, wages are growing but they are not making a huge impact on overall inflation, which remains relatively benign. Amazon (AMZN) makes up more than 23% of holdings in the Consumer Discretionary Select Sector SPDR ETF (XLY) so investors wanting exposure to Amazon might do so through XLY and get the additional diversification. Amazon doesn't pay a dividend but General Motors (GM) pays a 3.9% dividend and Target Corp. (TGT) has a dividend yield of 3.1%. EPS growth for CY2019 is expected to be 7.3% for the sector, down from a prior estimate of 9%, and is the second-highest earnings growth estimate after Industrials. The sector is trading at a premium to its historical PE ratio but analyst targets are 12% above current levels. Again this comes primarily from the newly added, higher growth sub-sectors, not the traditional telecom providers. We saw modest returns from the sector over the last month, but there were some big performers among its constituents. Costco Wholesale (COST) was up 12% and Mondelez International (MDLZ) was up 6.2%. There also are some attractive dividend payers in the sector, including Altria Group (MO) with a 5.7% dividend yield and Philip Morris International (PM) with a 5.3% yield. Growth prospects are still dim and the sector faces competition from upstarts like GrubHub (GRUB). Being a low-cost provider seems to be a good strategy as both Costco, Kroger, and others have performed well. Unfortunately, this will result in the battle for lower prices, which would lead to cost cuts in order to maintain margins - not good amid higher wages and drug reimbursement pressure. EPS growth forecasts call for just 1.2% growth and analyst price targets don't look very optimistic at levels just 3% above current prices. The sector does exhibit less volatility than most other sectors, so if you're looking for a decent yield, limited downside, and are willing to forego growth, this might be a good place to park money - but we are underweight the sector. Now that favorable year-over-year comparisons on earnings are history, the Energy sector should exhibit more normalized EPS growth going forward. We still believe capex spending growth will be lower in 2019 than in 2018, as oil price volatility has hampered broad capex investments and driven companies to focus on the most profitable geographic areas. Demand for oil and gas should remain strong as global growth remains positive, which would benefit oil and gas infrastructure plays like Master Limited Partnerships. We also saw the Baker Hughes oil rig count increase this past week for the first time in three weeks. Energy sector EPS are expected to decline 12% in CY 2019, down from a positive 8.6% growth estimate just a few months ago. The sector is flat-out cheap, however, with the forward PE of 18 well below the five-year and 10-year average PE of 28.7 and 20.2, respectively. According to FactSet, the current bottom up price target for the sector is 13.6% above current levels. With EPS growth expected to decline, analysts are expecting multiple expansion, particularly after the overdone sell-off. If the multiple expands from 18 to 28, there would be a 50% increase in price to offset the decline in EPS of 11%. With such low expectations for EPS growth, we believe the risk is to the upside. For diversification, consider the Energy Select Sector SPDR ETF (XLE), although note that Exxon and Chevron make up 42% of the ETF. Financial services were expected to benefit from rising rates, but the Fed's pause and the flat and partially inverted yield curve has weighed on the sector, especially banks that rely more heavily on lending. Those with more diversified business models like Citigroup, JPMorgan (JPM) and Bank of America (BAC) have other ways to increase profits. Mid-sized banks also might benefit from the recent increase in the level of assets required for stress testing. EPS growth is expected to be roughly 7.2% in 2019, and while this estimate was decreased from 8.6% just three months ago, the sector has the third-highest estimated EPS growth for 2019. Financials also look slightly undervalued, which means investors might be able to find good value with individual stock picks. Analyst price targets are 14% above current prices, which would result in the best performing sector if all sectors reach their estimated price targets. We believe this is another sector where risk is to the upside. Consumers are increasingly using healthcare despite higher deductible plans that have shifted costs from employers to employees. With the Affordable Care Act still lingering around, a higher than average number of consumers have remained insured - which has further increased spending. Pharmaceutical companies are investing heavily, which eventually leads to the next blockbuster drug, but public perception of these companies has been hurt by consensus opinions that pharma companies are intentionally charging higher prices. EPS growth estimates are 4.8% for 2019 but this estimate was lowered from 6.6% as of December. At a PE ratio of 15.5, the sector looks reasonably valued and price targets are 12% above current levels. For the time being, we recommend broad diversification through the Health Care Select Sector SPDR ETF (XLV) as we look for more tactical ideas to invest in the sector. The airlines have exhibited strong fundamentals despite the Boeing catastrophe. Low fuel costs, capacity growth, and rising demand for travel should continue to drive passenger growth. Industrials are expected to grow EPS by 8% in 2019, the strongest growth in EPS of any sector. PE multiples are in line with historical averages so returns will come primarily from earnings growth and dividends. Dividends are just 2%, but with 8% EPS growth, we expect a 10% return over 2019. That's in line with analyst price targets that are about 9.7% above current levels. Real Estate has outperformed all other sectors, which has left the sector slightly overvalued, in our opinion. We believe prospects are favorable but prices got too high too fast. The dynamics that affect real estate vary by sub sector, so it's difficult to draw conclusions from a broad perspective. Retailer bankruptcies and store closures will negatively impact Retail REITs, but higher quality landlords are redefining their offering and leveraging consumer demand for experiences and dining out. On the other hand, there's strong demand for medical office buildings, where patients can go as a one-stop-shop for medical care. In many sub-sectors, the more attractive opportunities are no longer in Class A properties or Tier 1 cities, but Class B and C properties located in secondary and tertiary cities. Investor tendency to always go high quality, Tier 1 should be carefully evaluated depending on the specific REITs geographic focus. The price/FFO of REITs has remained range bound over the last few years and currently looks reasonably valued and the payout ratio is just 68%, below the long-term average of 70%. The price target for Real Estate is just 1.2% above current levels, partly due to the 22% run up over the last 12 months. Investors satisfied with a 3.9% dividend yield should remain in the sector but we suggest an underweight because of better opportunities elsewhere. The removal of Facebook and Alphabet from the sector improves the dividend yield for the sector but dampens the growth outlook - in addition to confusing many investors to think they are going to be getting exposure to these two FANG stocks with an investment in a technology ETF like the Technology Select Sector SPDR ETF (XLK). Not necessarily - so make sure you know what you are buying. Data demand continues to grow at unprecedented levels and the release of 5G technology will only fuel that demand. As faster speeds become available, technology will improve to fill that bandwidth, only to reach a point that the bandwidth can't handle, which will drive innovation for faster speeds, etc. We see positive trends in the sector for the foreseeable future. 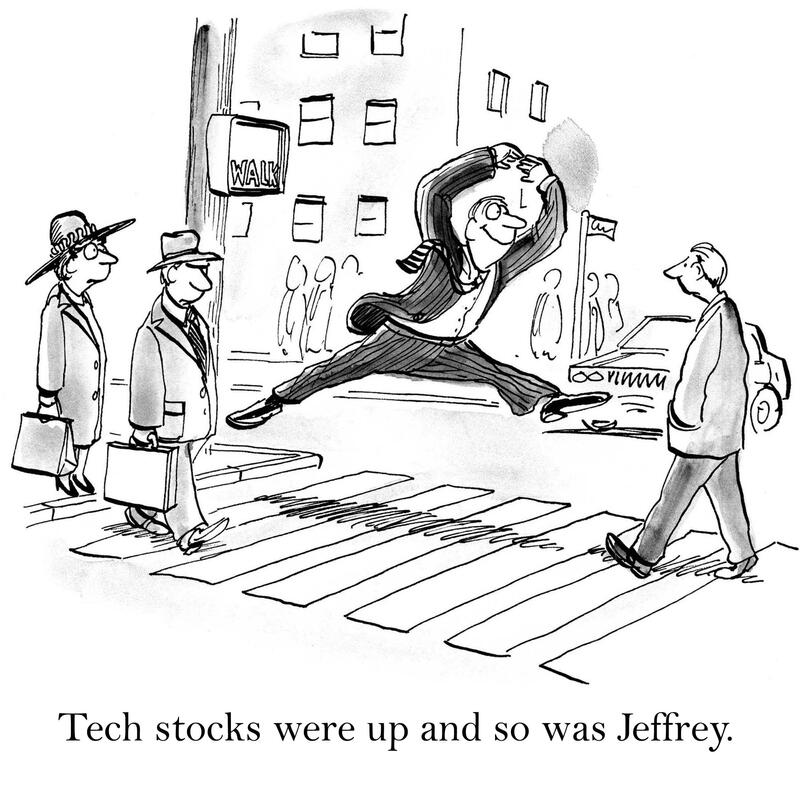 The biggest challenges will be valuations and picking the right stocks. Technology sector EPS growth is expected to be disappointing at just 1.5% and the PE for the sector looks pricey. FactSet price target estimates indicate a potential price return of just 6.4% but we believe these estimates are conservative and, just as importantly, we believe the PE multiple might continue to expand due to investor enthusiasm for the sector. Utilities exhibit relatively stable cash flow and earnings, and the recent FactSet EPS growth estimates of 6.8% are largely unchanged from the 6.9% EPS growth estimates from December. The sector looks slightly overvalued and price targets are just 1% above current prices. Despite its defensive characteristics, modest economic growth and a Fed looking to pause are two conflicting drivers. We believe dividends are secure but they aren't going to grow much and you're not likely to get much upside unless markets retrench again. We hope this summary has been useful and that you can apply it to your investment decision making. Just remember, by no means does an underweight suggest zero exposure to a sector, only that your exposure to the sector should be reduced relative to sectors with more favorable outlooks. As for what percentage of your US large-cap exposure should you allocate to overweight and underweight sectors? That really depends on your personal preferences, objectives, and what else you might have in the portfolio. We suggest using the ratings as a way of gauging when you should have higher or lower than normal exposure to each sector based on your own asset allocation strategy. And lastly, when in doubt, just stay with the SPDR S&P 500 Trust ETF (SPY) for your US Large Cap exposure. Additional disclosure: This article is meant to identify an idea for further research and analysis and should not be taken as a recommendation to invest. It does not provide individualized advice or recommendations for any specific reader. Also, note that we may not cover all relevant risks related to the ideas presented in this article. Readers should conduct their own due diligence and carefully consider their own investment objectives, risk tolerance, time horizon, tax situation, liquidity needs, and concentration levels, or contact their advisor to determine if any ideas presented here are appropriate for their unique circumstances.